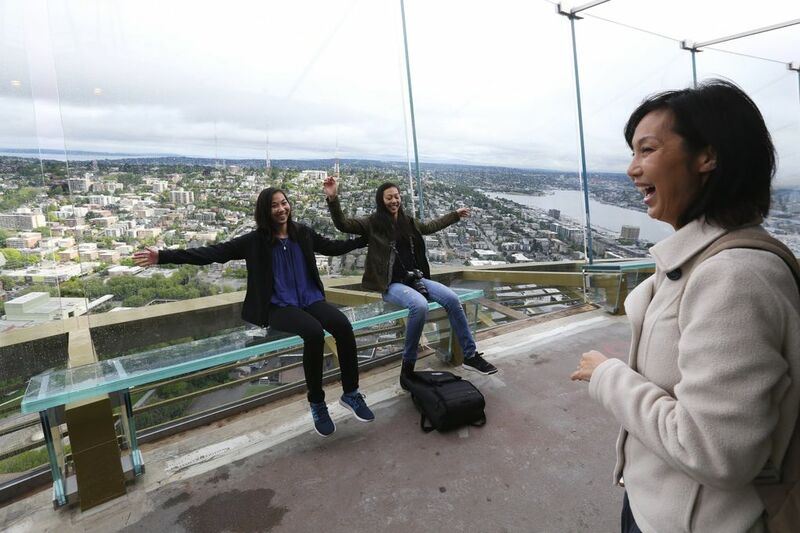 Bethany Jean Clement and Tan Vinh went and tried them all in order to find the best value for your view-bucks. But you’re still in an office building, even if it’s the 73rd floor. The corporate wall-to-wall carpeting and low acoustic-tile ceiling give the place all the excitement and romance of a conference room, while the counter-service cafe is exactly as inviting as one in a hospital lobby. And once you notice it, the Muzak-y soundtrack bores into your brain. Tan: Don’t bother trying to get your bearings by using the interactive maps along the windows — they have a baffling orientation. One map said Elliott Bay was to my left. It was to my right. Another map pointed to such important Seattle landmarks as Redhook brewpub on Capitol Hill (definitely not visible from here). I should have taken that as a hint to drink beer. The cocktails were awful. Bethany: Flanking a line of droopy arugula garnish, four Dungeness-crab-stuffed mushrooms ($9.50) possessed a seafood taste so vague, you could probably get the same effect by licking the Sky View glass overlooking Elliott Bay. The “West Coast Chicken Melt” ($8.65) featured planks of tasteless chicken breast, pieces of underripe avocado and the sad aspect of a sandwich that’s been warmed up in an airplane’s galley, then wheeled very slowly down the aisle. Tan called the Margherita flatbread ($8) “like elementary-school cafeteria pizza” — he did not mean this as a compliment — but with its tart tomato sauce, melty mozzarella, actual fresh basil and inoffensive thin crust, it was the only thing we ended up eating all of, and thus, the clear winner. Tan: A berry take on the French 75 fell flat because the Prosecco was no longer sparkling. Its Manhattan didn’t resemble the whiskey classic. And Bethany concluded that its take on the margarita was easily the worst cocktail she had in years. I was more generous; it was the worst cocktail I had this year. (I hit more bars than Bethany.) 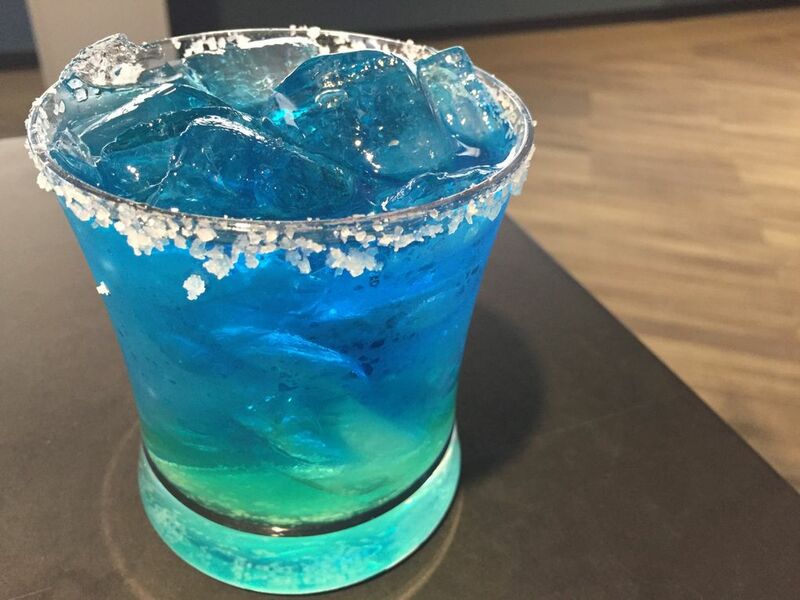 It’s a margarita draped in Seahawk colors thanks to blue curacao and made with lemon instead of the traditional lime — it tasted like citrusy-flavored syrup. Beer or wine is the way to go. The bar’s craft-beer roster includes Black Raven and Fremont Brewing ($6-$7). On a date? Get a bottle of Prosecco ($28). Bethany: With zero of the charm of the Smith Tower, a much more vast but far less thrilling view than the Space Needle and that unforgivable blue chemical nightmare of a cocktail, Sky View comes in a distant third place for me. Tan: I agree on the third-place ranking, though I would put an asterisk. Your experience will vary dramatically depending on time of day. During the day, the lighting in the room is so bright — harsh to the point of being a distraction. After sunset, when the staff dims the lights, is the time to go. It has a more Cary-Grant-Deborah-Kerr-meet-me-at-the-top vibe. Bethany: Those of us who grew up in Seattle can’t help but love the iconic Space Needle, built for the 1962 World’s Fair, even as we pine for the time when you could fib and say you had a restaurant reservation to get a free elevator ride to the top. Now it’s $75 for two people!? And we had to wait a half-hour for our ticket-appointed time, plus 40 very long minutes in a snaking-around-the-base line. The scene at the top was chaos: crowded everywhere, with ceilings still unfinished from the $100 million renovation, and multiple workers vacuuming throughout the space at prime time, making movement even more difficult. Tan: The hour wait to the top felt more like two hours, what with the scrum of tourists and kids. Every step in line may have ascended us closer to heaven, but it felt more like being in hell. The good news: I got smacked by a selfie stick only once. But perched up top, I’m reminded of what a beautiful city we live in, even with all the high-risers sprouting the landscape in recent years. Tan: The smell of fall spices was notable when the elevator opened. It’s caramel popcorn, and it’s very popular here, the cashier informed me, before adding that the machine just broke down and there would be no popcorn for me after all. The tater tots that were part of the fish and chips turned out to be the best thing I ate. The deep-fried fillets were crunchy and salty, but devoid of any taste resembling fish. 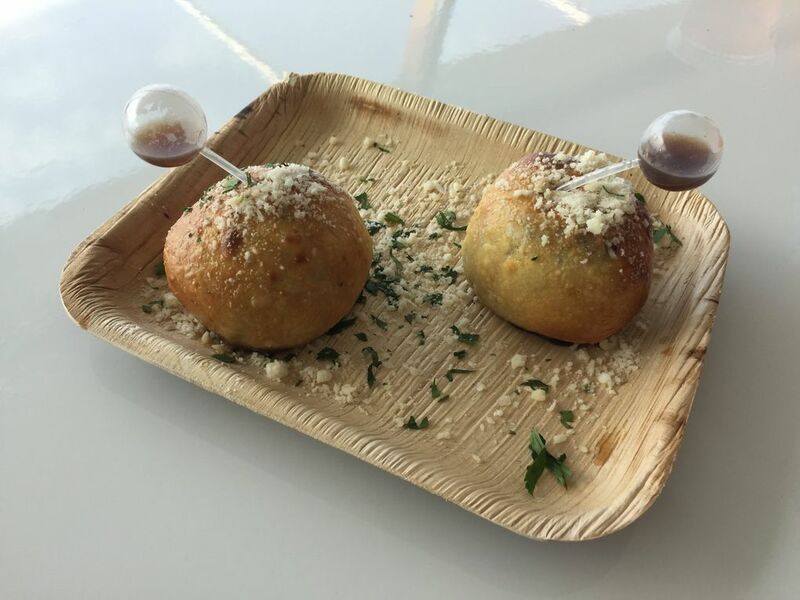 There was a subset of food that defies explanation: a congealed mac and cheese molded into a shape of a donut and coated in beet-colored crumbs; “French Dip Bites” reimagined as mini Hot Pockets planted with plastic capsules au jus. The food engineers behind these gimmicks had Instagram in mind with no consideration that the food should also be edible. 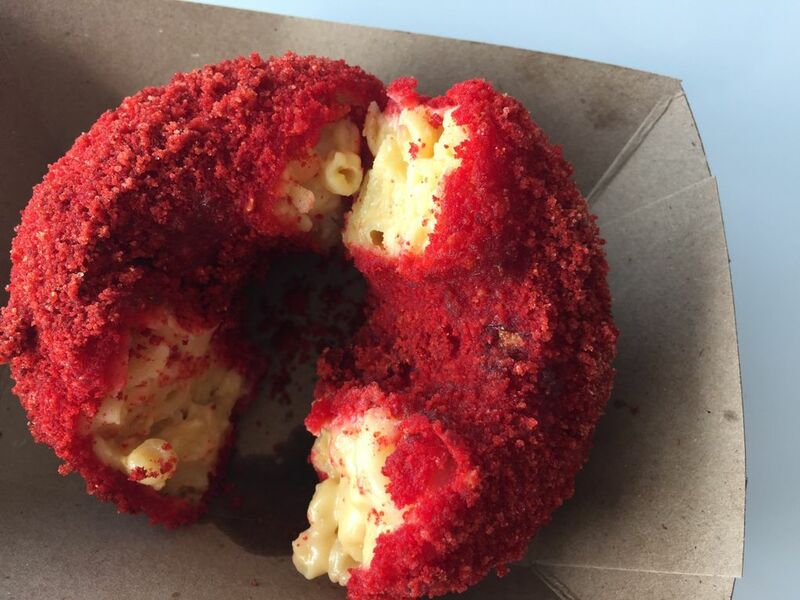 The red-velvet-donut-looking mac and cheese tasted like powdered milk. The meat filling in the French dip tasted like rehydrated beef. The Space Needle appeared to be channeling astronaut food; I worried Tang would be our only drink option. Bethany: The basic beer and wine selection at the Space Needle’s cafe looks like a smart choice compared to the botched fancy cocktails that come with the other two views. The prices, however, make you feel duped: $9 for a 12-ounce local draft (that’s not even a pint! ), $13 for a can of Underwood sparkling wine (which costs less than half that at ground-level retail) and 10 bucks for a Rainier tallboy (!?). Well, someone’s got to finance the renovation. Bethany: I’ll go up in the Space Needle anytime someone else is paying and buying me sparkling wine … and when there isn’t a 70-minute wait time. Maybe a clear day in December? Tan: What she said, although I wouldn’t order a $10 Rainier even if somebody picked up the tab just on principle. Bethany: With a neoclassical granite-and-terra-cotta exterior, polished marble entryways and brass-trimmed elevators, the Smith Tower is a beauty. Completed in 1914, it held the title of tallest building on the West Coast until the Space Needle made its debut. 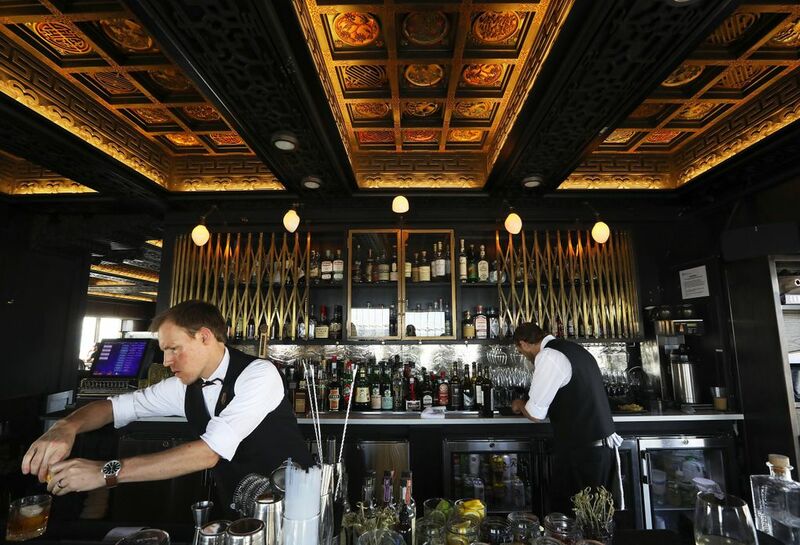 It may be dwarfed by the other contestants, but with a drink from the bar and a seat under the ornately carved teak ceiling, you experience a sense of time as well as place here. (Just keep the drink simple — see below — and try not to notice the clashing chairs, a far cry from the original furnishings sent by the last Empress of China.) Then stroll around the open-air exterior walkway for the none-too-shabby view. 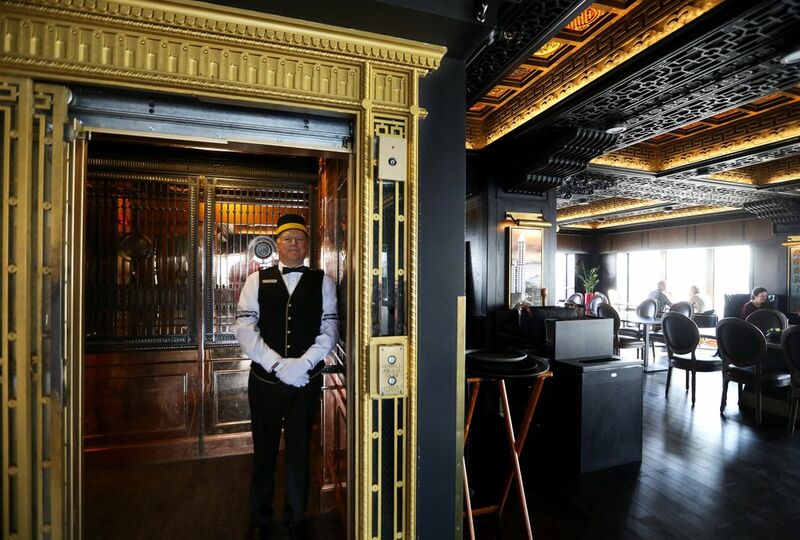 Tan: Smith Tower had the most focused narrative: an Asian motif, faux-speakeasy bar. During its inception, this was “The Chinese Room,” hence the Asian decor and food. Bootleg boss Roy Olmstead may have used coded messages from inside this building for his rum-running boat operation during Prohibition. Hence the craft-cocktail theme here. 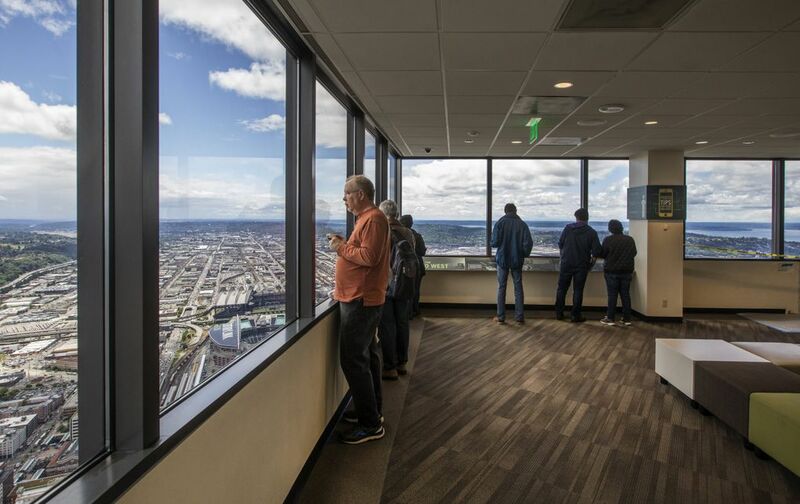 Of the three observation decks, Smith Tower told its story best. Tourists don’t have to strain their brains. Just looking at the Prohibition-era black-and-white photos and the decor will clue you in without having to read the text. Bethany: Folded into peculiar bundles, the potstickers ($15) were chewy and dry, their filling more of a texture than a flavor, and a mushy one at that. The sambal-marinated tofu inside the banh mi ($13) tasted overwhelmingly sour and on the verge of disintegration, too; the roll contrasted with notable toughness. 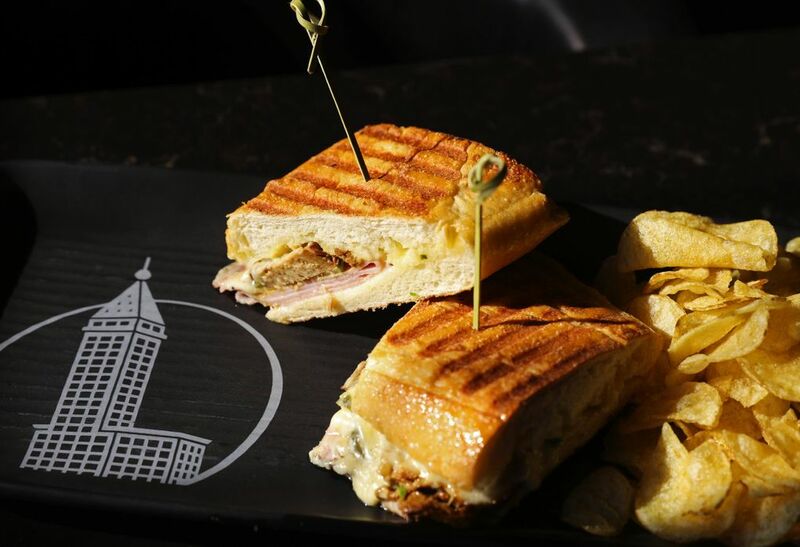 We tried several more things … suffice to say that the best bet may be the Cuban-style pressed pork belly sandwich ($16), with a crispy-toasted outside and nicely drippy contents. Just ask for extra pickles and maybe some mustard (and specify whether you want kettle chips or the world’s most lackluster side salad, or you may not get either). Tan: The most ambitious drink list of the three, this bar comes with barrel-aged cocktails and a big whiskey selection. The drink program aims just as high as any cocktail den on Capitol Hill. A more experienced hand behind the bar would’ve fixed the little details that were off. The daiquiri was syrupy sweet. The tequila cocktail special tasted more like an Aperol aperitif. And the barrel-aged cocktail lacked that pronounced oaky punch — likely because the barrel was past its shelf life. The best drink was — not coincidentally — the most simple: The Newcomer, a single-malt old-fashioned with zesty bitters to play off the sweet malty notes — a clean, stiff drink ($15). Keep your drink order simple. 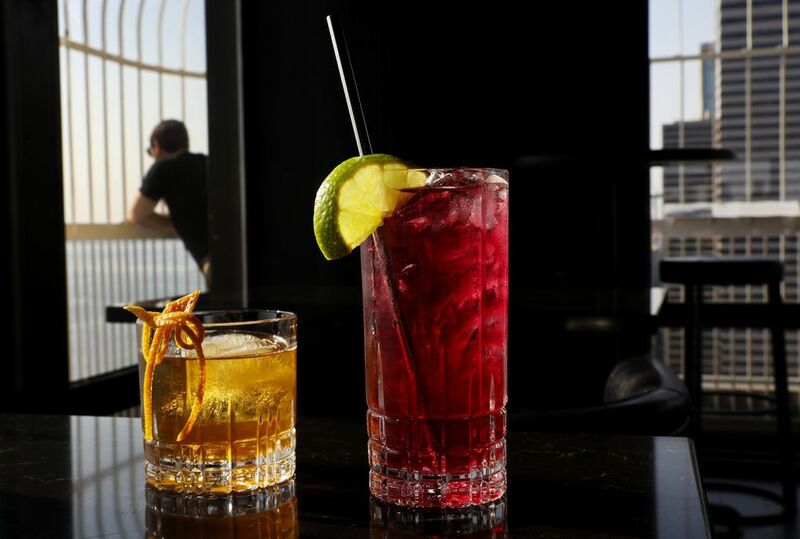 Among the good deals: Rainier goes for $3 during happy hour and a flight of three whiskeys is $22. Tan: This had the most relaxed atmosphere and felt least touristy of the three. Also, its happy hour (admission is $8; drink specials for $8 or less) is a bargain for those entertaining out-of-town guests on a budget. 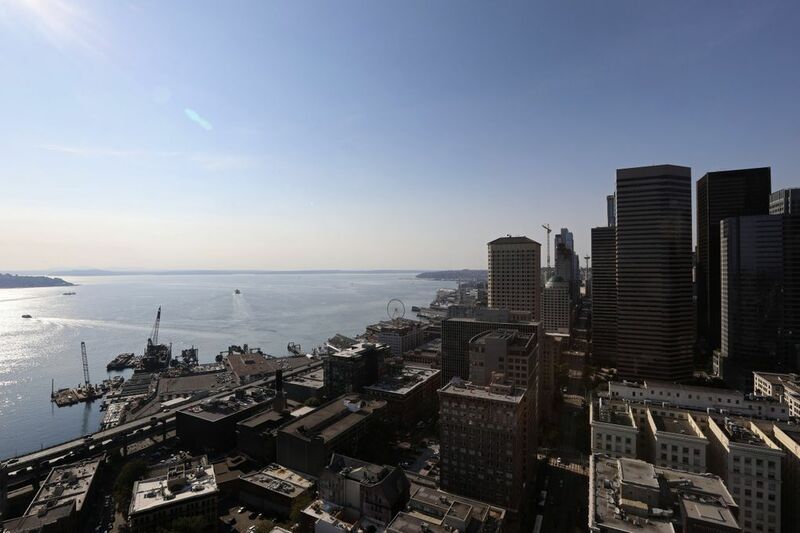 Bethany: Good things come in small packages, and Seattle’s historic Smith Tower is a jewel.